Spikelets solitary, shortly pedicelled, laterally compressed, 1-flowered, but usually with 1-2 sterile and much reduced florets; rhachilla disarticulating above the glumes, not or only spuriously extended beyond the terminal floret; florets usually 3, the first and second rudimentary, minute, the terminal one hermaphrodite. Glumes 2, equal to subequal, 3-nerved, persistent, completely enclosing the floret (s), cymbi-form, often strongly keeled, membranous, with the keel broadly winged. Sterile lemmas very small (often scale-like), subulate to lanceolate, membranous with a callous base, the fertile one 5-nerved, membranous at first, later coriaceous to indurate, often glossy, broadly ovate, acute. Palea c. as long as the lemma, 2-nerved, hyaline, usually ciliolate along the keels. Ovary elliptic in outline, glabrous; styles distinct, long; stigmas plumose, slender, apically exserted. Caryopsis ovate to ovate-elliptic in outline, somewhat laterally flattened, enclosed by the lemma and palea; hilum oblong or linear, short; embryo 1/4-1/3 the length of the caryopsis. Inflorescence a many-flowered rather condensed spike-like panicle, often capitate. Glumes usually glabrous, papery, boat-shaped, keeled, the keel often broadened into a wing; sterile florets up to about half as long as the fertile lemma, subulate or chaffy, usually pubescent, sometimes 1 or both reduced to a fleshy scale at the base of the fertile floret; fertile lemma glabrous or pubescent, often shiny. Annual (11), or perennial (6). Rhizomes absent (13), or short (2), or elongated (2). 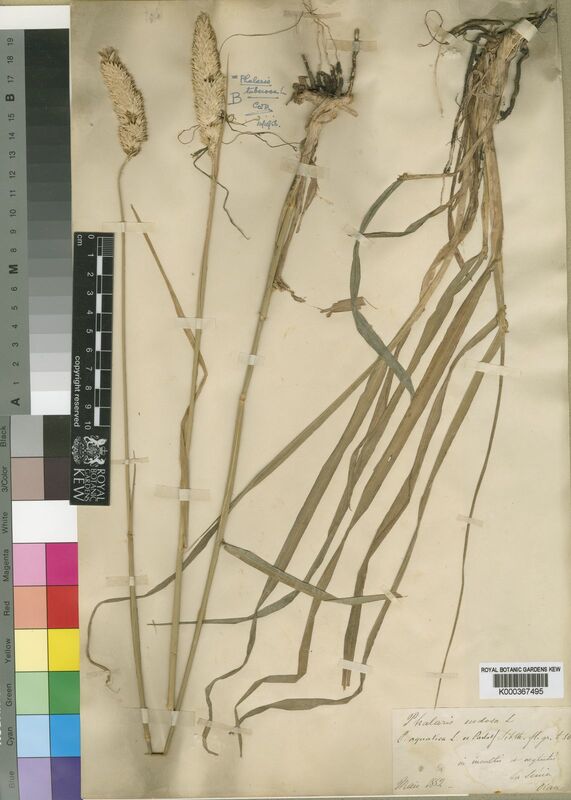 Culms erect (6/6), or geniculately ascending (4/6); 10-88.52-200 cm long. Ligule an eciliate membrane. Leaf-blades firm (16), or flaccid (1). 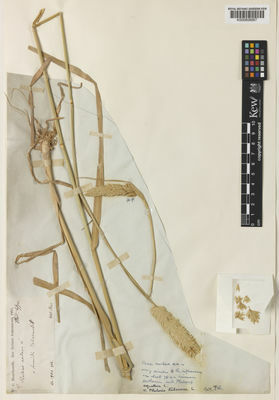 Inflorescence a panicle; subtended by an unspecialized leaf-sheath (16), or an inflated leaf-sheath (1); exserted (16), or embraced at base by subtending leaf (1). 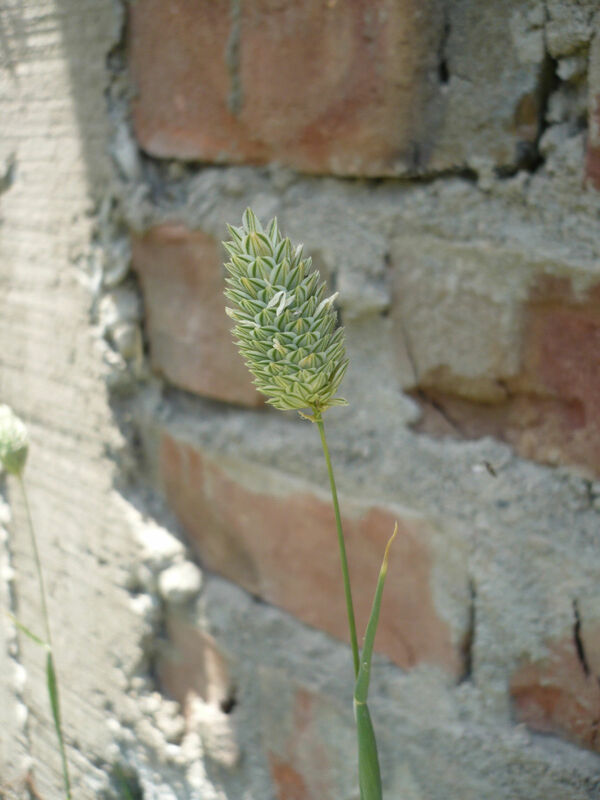 Panicle contracted (1), or spiciform (16), or capitate (2). Panicle axis bearing persistent branches (16), or deciduous spikelet clusters (2). 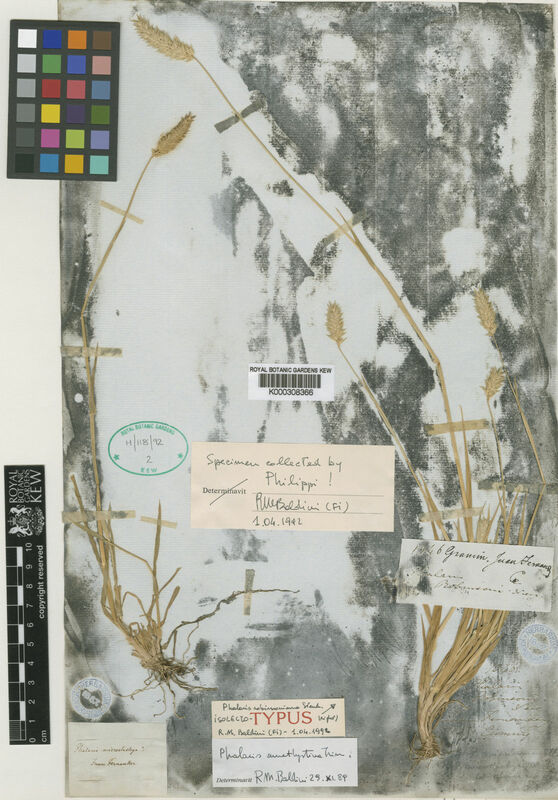 Spikelets appressed (2/3), or ascending (1/3); solitary (16), or subtended by an involucre (2). Fertile spikelets sessile (10), or pedicelled (8); 1 in the cluster (2/2), or 2 in the cluster (1/2). Companion sterile spikelets pedicelled (2/2); 5 in the cluster (1/2), or 6 in the cluster (2/2). Involucre composed of imperfect spikelets (2/2). Pedicels linear (1/1); tip cupuliform (1/1). Companion sterile spikelets absent (15), or well-developed (2); deciduous with the fertile (2/2). Spikelets comprising 2 basal sterile florets; 1 fertile florets; without rhachilla extension. Spikelets elliptic (1), or ovate (2), or obovate (14); laterally compressed; 2.9-6.046-10 mm long; falling entire (2), or breaking up at maturity (16); deciduous with accessory branch structures (2/2); disarticulating below each fertile floret (16/16). Companion sterile spikelets absent (15), or well-developed (2); deciduous with the fertile (2/2). Spikelets comprising 2 basal sterile florets; 1 fertile florets; without rhachilla extension. Spikelets elliptic (1), or ovate (2), or obovate (14); laterally compressed; 2.9-6.046-10 mm long; falling entire (2), or breaking up at maturity (16); deciduous with accessory branch structures (2/2); disarticulating below each fertile floret (16/16). 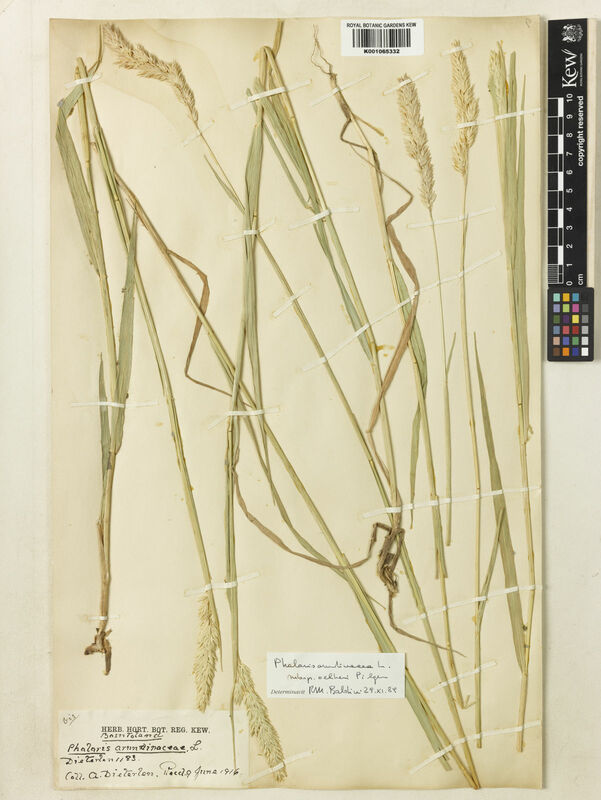 Glumes persistent (16/16); exceeding apex of florets; thinner than fertile lemma. Lower glume lanceolate (1), or elliptic (15), or ovate (1); 1 length of upper glume; chartaceous; 1-keeled; wingless (5), or winged on keel (14); 3 -veined (16/16), or 4-5 -veined (6/16). Lower glume surface smooth (11), or asperulous (3), or scabrous (3); glabrous (16), or pubescent (1), or pilose (3). Lower glume apex truncate (4), or obtuse (1), or acute (11), or acuminate (4), or setaceously attenuate (1). Upper glume lanceolate (1), or elliptic (15), or ovate (1); 1.2-1.52-3 length of adjacent fertile lemma; chartaceous; 1-keeled; wingless (4), or winged on keel (15); 3 -veined (16/16), or 4-5 -veined (6/16). Upper glume surface smooth (11), or asperulous (3), or scabrous (3); glabrous (16), or pubescent (1), or pilose (3). Upper glume apex truncate (4), or obtuse (1), or acute (11), or acuminate (4), or setaceously attenuate (1). Basal sterile florets barren (14/14); without significant palea (14/14). 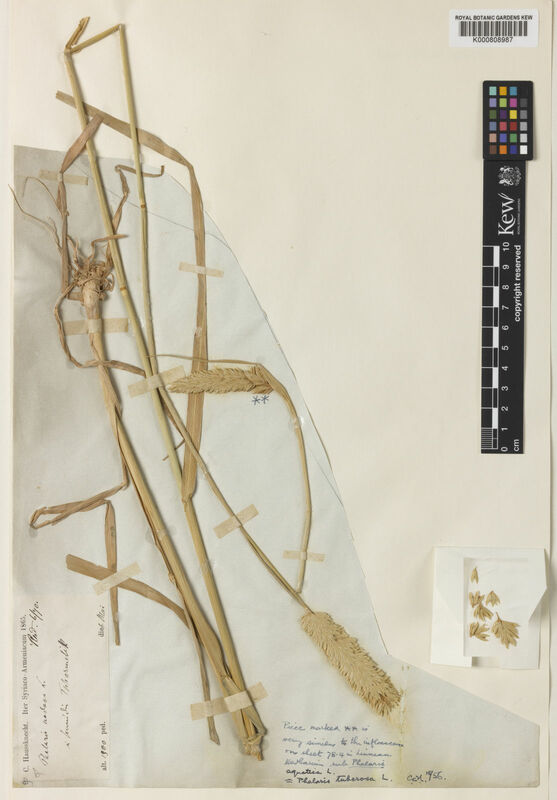 Lemma of lower sterile floret subulate (3/13), or linear (7/13), or lanceolate (1/13), or ovate (2/13); 0.1-0.3895-0.75 length of fertile lemma; membranous (2/4), or fleshy (2/4); acute (3/3). Fertile lemma elliptic (15), or ovate (2); laterally compressed (15/16), or subterete (1/16); cartilaginous (16), or coriaceous (1); keeled; 5 -veined. Lemma surface glabrous (3), or pubescent (15). Lemma apex obtuse (1), or acute (15), or acuminate (1). Palea cartilaginous (16), or coriaceous (1); 2 -veined; without keels. Palea surface glabrous (3), or pubescent (14). Lodicules 2 (10/10); membranous (10/10). Anthers 3. Ovary glabrous (15/15). Caryopsis with adherent pericarp (15/15). Hilum linear (15/15). Europe (8), or Africa (10), or Temperate Asia (8), or Tropical Asia (6), or Australasia (7), or Pacific (4), or North America (9), or South America (11), or Antarctica (1). Phalaris californica Hook. & Arn. Baldingera G.Gaertn., B.Mey. & Schreb. Gen. Pl., ed. 5: 29 (1754).